Unusual attitudes are some of the most hazardous situations for a pilot to be in. Without proper recovery training on instrument interpretation and aircraft control, a pilot can quickly aggravate an abnormal flight attitude into a potentially fatal accident. Analog gauges require the pilot to scan between instruments to deduce the aircraft attitude. Individually, these gauges lack the necessary information needed for a successful recovery. EFDs have additional features to aid in recognition and recovery from unusual flight attitudes. 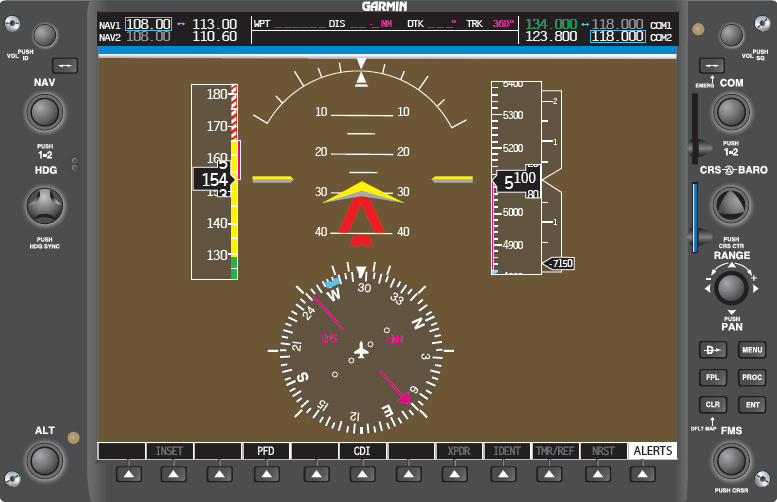 The PFD displays all the flight instruments on one screen. Each instrument is superimposed over a full-screen representation of the attitude indicator. With this configuration, the pilot no longer needs to transition from one instrument to another. The new unusual attitude recovery protection allows the pilot to be able to quickly determine the aircraft’s attitude and make a safe, proper, and prompt recovery. 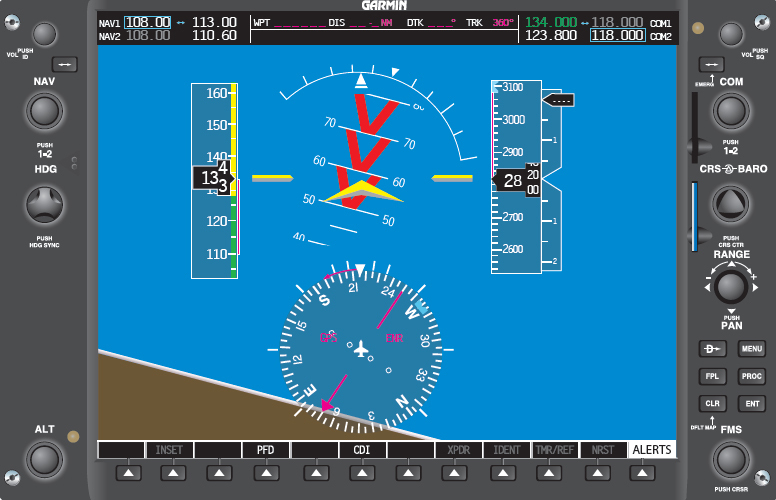 Situational awareness is increased by the introduction of the large full-width artificial horizon depicted on the PFD. This now allows for the attitude indicator to be in view during all portions of the scan. One problem with analog gauges is that the attitude indicator displays a complete blue or brown segment when the pitch attitude is increased toward 90° nose-up or nose-down. With the EFDs, the attitude indicator is designed to retain a portion of both sky and land representation at all times. This improvement allows the pilot to always know the quickest way to return to the horizon. Situational awareness is greatly increased. It is imperative to understand that the white line on the attitude indicator is the horizon line. The break between the blue and brown symbols is only a reference and should not be thought of as the artificial horizon. Another important advancement is the development of the unusual attitude recovery protection that is built into the PFD software and made capable by the AHRS. In the case of a nosehigh unusual attitude, the unusual attitude recovery protection displays red chevrons that point back to the horizon line. These chevrons are positioned at 50° up on the attitude indicator. The chevrons appear when the aircraft approaches a nose-high attitude of 30°. 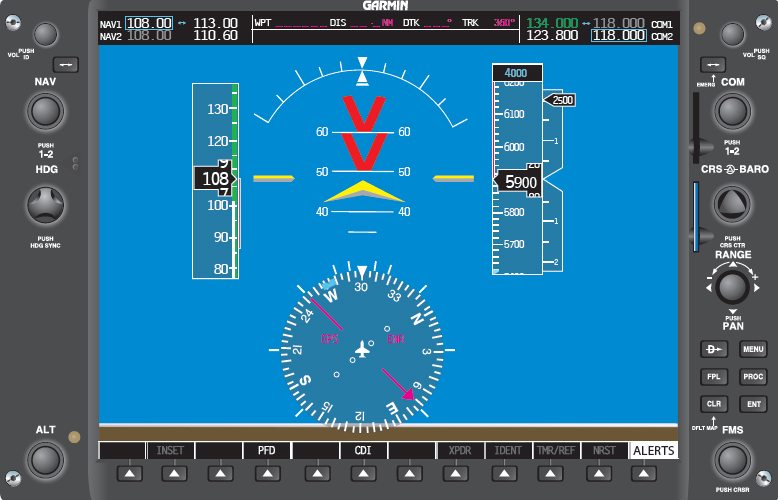 The software automatically declutters the PFD leaving only airspeed, heading, attitude, altimeter, VSI tape, and the trend vectors. The decluttered information reappears when the pitch attitude falls below 25°. For nose-low unusual attitudes, the chevrons are displayed when the pitch exceeds 15° nose-down. If the pitch continues to decrease, the unusual attitude recovery protection declutters the screen at 20° nose-down. The decluttered information reappears when the pitch increases above 15°. Additionally, there are bank limits that trigger the unusual attitude protection. If the aircraft’s bank increases beyond 60°, a continuation of the roll index occurs to indicate the shortest direction to roll the wings back to level. At 65°, the PFD de-clutters. All information reappears when the bank decreases below 60°. In Figure 7-71, the aircraft has rolled past 60°. Observe the white line that continues from the end of the bank index. This line appears to indicate the shortest distance back to wings level. When experiencing a failure of the AHRS unit, all unusual attitude protection is lost. The failure of the AHRS results in the loss of all heading and attitude indications on the PFD. In addition, all modes of the autopilot, except for roll and altitude hold, are lost. The following picture series represents how important this technology is in increasing situational awareness, and how critical it is in improving safety. 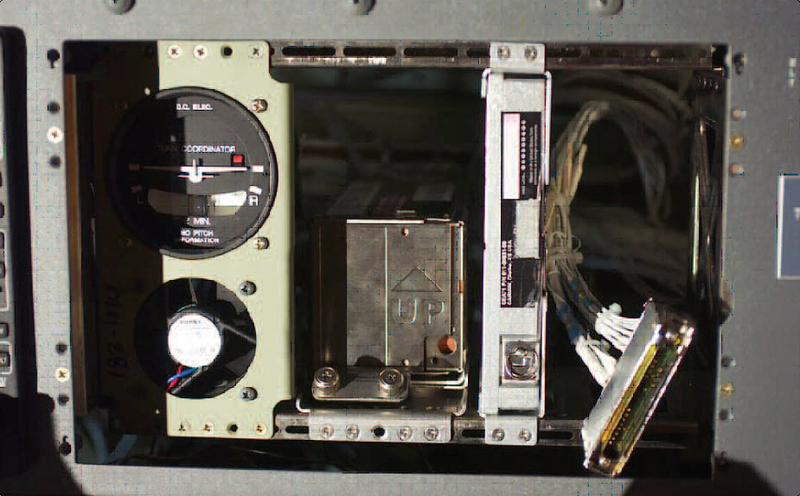 Figure 7-72 shows the unusual attitude protection with valid AHRS and air data computer (ADC) inputs. The bright red chevrons pointing down to the horizon indicate a nose-high unusual attitude that can be easily recognized and corrected. NOTE: The red chevrons point back to the level pitch attitude. The trend indicators show where the airspeed and altitude will be in 6 seconds. The trend indicator on the heading indicator shows which direction the aircraft is turning. The slip/skid indicator clearly shows if the aircraft is coordinated. This information helps the pilot determine which type of unusual attitude the aircraft has taken. Now look at Figure 7-73. The display shows the same airspeed as the picture above; however, the AHRS unit has failed. The altimeter and the VSI tape are the only clear indications that the aircraft is in a nose-high attitude. The one key instrument that is no longer present is the slip/skid indicator. There is not a standby turn coordinator installed in the aircraft for the pilot to reference. The magnetic compass indicates a heading is being maintained; however, it is not as useful as a turn coordinator or slip/skid indicator. Figure 7-74 depicts an AHRS and ADC failure. 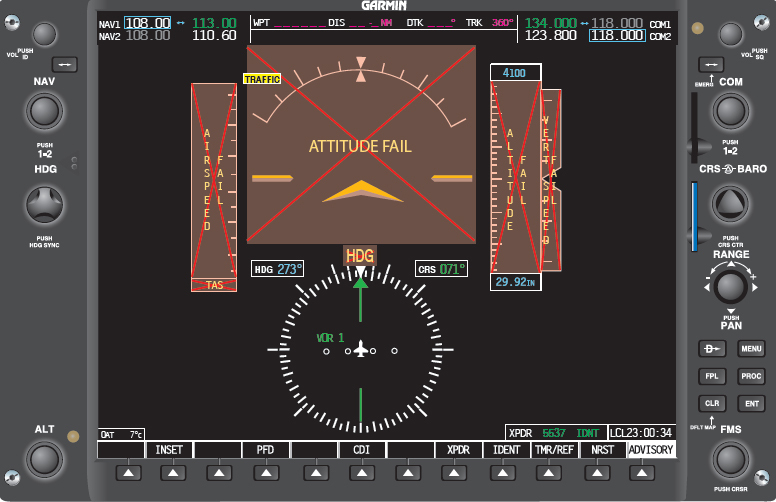 In this failure scenario, there are no indications of the aircraft’s attitude. The manufacturer recommends turning on the autopilot, which is simply a wing leveler. With a failure of the primary instrumentation on the PFD, the only references available are the standby instruments. The standby instrumentation consists of an analog ASI, attitude indicator, altimeter, and magnetic compass. There is no standby turn coordinator installed. 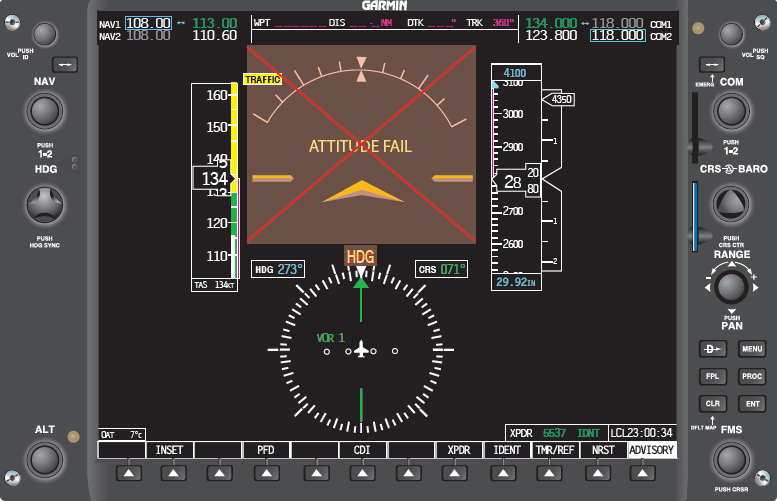 In extreme nose-high or nose-low pitch attitudes, as well as high bank angles, the analog attitude indicator has the potential to tumble, rendering it unusable. 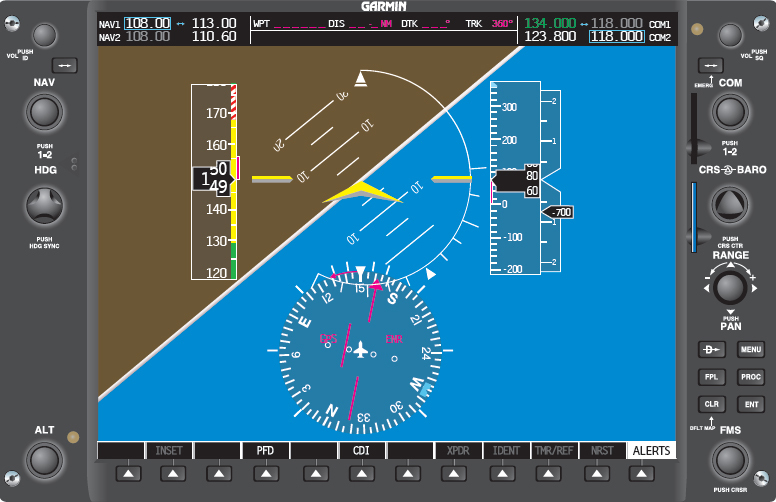 The autopilot is equipped with inputs from a turn coordinator installed behind the MFD screen. This turn coordinator is installed solely for the use of the autopilot to facilitate the roll mode, which is simply a wing leveler. This protection is always available, barring a failure of the turn coordinator (to aid the pilot if the aircraft attains an unusual attitude). Figure 7-75. This autopilot requires roll information from a turn coordinator. Most EFD equipped aircraft are coming from the factory with autopilots installed. However, the purchaser of the aircraft can specify if an autopilot is to be installed. Extreme caution should be utilized when flying an EFD equipped aircraft without an autopilot in IMC with an AHRS and ADC failure. The autopilot should be utilized to reduce workload, which affords the pilot more time to monitor the flight. Utilization of the autopilot also decreases the chances of entry into an unusual attitude. Flying an EFD-equipped aircraft without the use of an autopilot has been shown to increase workload and decrease situational awareness for pilots first learning to flying the new system. The following errors have the potential to disrupt a pilot’s situational awareness and lead to unusual attitudes. Improper trimming techniques. A failure to keep the aircraft trimmed for level flight at all times can turn a momentary distraction into an emergency situation if the pilot stops cross-checking. Poor crew resource management (CRM) skills. Failure to perform all single-pilot resource management duties efficiently. A major cause of CRM-related accidents comes from the failure of the pilot to maintain an organized flight deck. Items that are being utilized for the flight portion should be neatly arranged for easy access. A disorganized flight deck can lead to a distraction that causes the pilot to cease cross-checking the instruments long enough to enter an unusual attitude. Fixation is displayed when a pilot focuses far too much attention on one instrument because he or she perceives something is wrong or a deviation is occurring. It is important for the instrument pilot to remember that a cross-check of several instruments for corroboration is more valuable than checking a single instrument. Attempting to recover by sensory sensations other than sight. Recovery by instinct almost always leads to erroneous corrections due to the illusions that are prevalent during instrument flight. Failure to practice basic attitude instrument flying. When a pilot does not fly instrument approach procedures or even basic attitude instrument flying maneuvers for long periods of time, skill levels diminish. Pilots should avoid flying in IMC if they are not proficient. They should seek a qualified instructor to receive additional instruction prior to entry into IMC.